The TRITOflex seamless liquid rubber roofing system is ideal for retrofitting an existing embedded gravel roof in order to avoid a costly and disruptive tear-off. 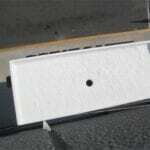 The most common gravel roof assembly is a loose-laid EPDM membrane over a rigid insulation board. 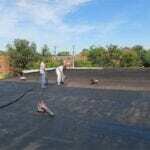 Then, stones or gravel (ballast) are placed on top of the EPDM to hold it in place, without any fastening or adhesion. The weight of the rocks can vary from 10 pounds per square foot to 25 pounds or more. Typically, the edges of the roof and areas around penetrations will be the first sections to deteriorate, allowing water to enter. A ballasted roof repair will be necessary to eliminate all water intrusions, which can be done by moving or removing the ballast. TRITOflex is lightweight and is quickly spray applied to any thickness in one coat to the existing roof after all loose gravel is removed.TRITOflexis able to form a seamless rubber membrane without the need of any fabric reinforcement or underlayment.TRITOflex is able to conform to the extremely uneven surface of the gravel without splitting and creates a fully adhered, watertight membrane. 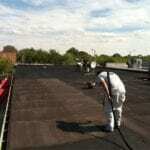 When completed with a TRITOthermreflective top coat, it becomes a highly energy efficient roof as well.